On the 10th of May, 1940, with the Nazi war machine sweeping across mainland Europe and pushing British and French forces into the sea at Dunkirk, Winston Churchill replaced Neville Chamberlain as the Prime Minister of England. It was a desperate time, with invasion seemingly imminent and many in the British government pushing for Churchill to sue for peace with Hitler. Instead, the new Prime Minister rallied his nation to war, in the face of overwhelming odds, rightly knowing that “You cannot reason with a tiger when your head is in its mouth!” Churchill’s hope was that Britain could hold out long enough to convince the United States to join its cause. 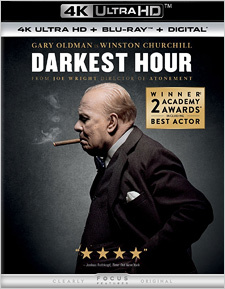 Joe Wright’s Darkest Hour is the story of this difficult period of history, Churchill’s perilous first month in office, up to and including his famous speech to the House of Commons on June 4th. The film stars Gary Oldman in arguably the finest performance of his career. It’s hard to imagine a face as familiar as Oldman’s disappearing into any role, much less Churchill, but disappear he does. It’s not just superb makeup that does the trick here; Oldman somehow assumes Churchill’s manner and affectations with such skill and aplomb that even historians working on the film were surprised. The supporting cast delivers fine performances too, including Kristin Scott Thomas (The English Patient) as Churchill’s wife, Lily James (Baby Driver) as his personal secretary, Ben Mendelsohn (Rogue One) as King George VI, and Stephen Dillane (Game of Thrones) as Lord Halifax. Pulling things together, Wright’s direction is deft and insightful, with a strong theatrical touch, balancing the personal moments with key historical events. This is, all around, a brilliant piece of work. Darkest Hour was shot digitally in the ARRIRAW codec (at 3.4K) using ARRI Alexa cameras with Cooke S4 and Angenieux Optimo lenses. It was finished as a native 4K Digital Intermediate, given a high dynamic range grade in HDR10, and is presented here on Ultra HD at the proper 1.85:1 theatrical aspect ratio. The resulting image is exquisite and a strong improvement upon the already fine Blu-ray edition (reviewed here). After Blade Runner 2049, which rightly took home the Oscar for Best Cinematography, there was no better work done behind the camera last year than the efforts of Bruno Delbonnel (Inside Llewyn Davis, Amélie, Across the Universe) which are on display in this film. The 4K image offers lovely fine detail and texturing, evident in everything from wallpaper and fabric to skin and wood grain. The high dynamic range strongly enhances the contrast here. Objects are often backlit and, when in the foreground, the shadows are deeply black. But the use of on-set smoke creates a dense atmosphere which means that the farther objects are away from the camera lens, shadows gradually become more gray, an effect that creates a remarkable sense of depth. Scenes set in the British Parliament have deep shadows with strong shafts of white light lancing down from above. The brightest areas of the frame are boldly bright, even sometimes eye-reactive. You notice the improvement in little details, like gleaming crystal glassware, shining gold accents on the King’s furniture in Buckingham Palace, and the luminous quality of lamp and candle light. The color timing is pushed toward the warm in this film, and the wider color gamut of Ultra HD deepens the already lush tones while adding nuance to the many subtle shadings in between. In Churchill’s first appearance in the film, during a working breakfast in bed, you can see gold, blue, orange, and green books in the case beside his bed, while the brandy in his glass is a rich caramel color, and his skin tones are completely natural. This is a gorgeous image; one of the finest I’ve seen yet on this format. To be sure, there are titles on Ultra HD with an edge on this in fine detail, or sheer pop in terms of color or contrast, but the whole of this presentation is so strong, combined with the brilliant photography, that it’s just a wonder to behold. Primary audio on the 4K disc is included in the same English Dolby Atmos mix (Dolby TrueHD compatible) that’s found on the Blu-ray edition. It’s expansive up front and features nice use of the surround channels for ambience and directional effects. The height channels are employed for sonic atmosphere too, but there are occasions when they offer a bit of good effects play, particularly during the film’s theatrically-staged transitions (via motorcar, aircraft, and elevator). The dialogue is clear and clean, there’s a light but stout foundation of LFE, and the Dario Marianelli score is well blended into the mix. Additional audio options include Spanish 7.1 Dolby Digital Plus and French 5.1 Dolby Digital (note that the English Descriptive Audio from the Blu-ray is not here), with optional subtitles in English SDH, Spanish, and French. The audio commentary is quite good, definitely the highlight of the disc. There are periods in which Wright says little, or uses few words, but when he does speak his observations are interesting. The two video features do include generous screen time for both Wright and Oldman, as they talk about the character work and the production overall. They’re solid, but nowhere near comprehensive. Essentially, they’re EPK material. The film certainly deserves more. Even a good historical documentary would have been appreciated. You do at least get a Movies Anywhere digital code on a paper insert in the package. Darkest Hour is a magnificent film that won a well-deserving Oldman his first Oscar for Best Actor. Wright and Oldman do a fine job of humanizing this bigger-than-life historical figure, a deeply flawed human being who was also exactly the right man at the right time. And Universal’s 4K Ultra HD release is, as expected, remarkable. There is truly no better way to watch this film. Fans of Christopher Nolan’s Dunkirk (reviewed here) should also note that Darkest Hour makes a perfect double feature with it; Wright’s film gives viewers exactly the background and war room material that Nolan’s omits. In any case, Darkest Hour is a gem. Don’t miss it... especially in 4K.